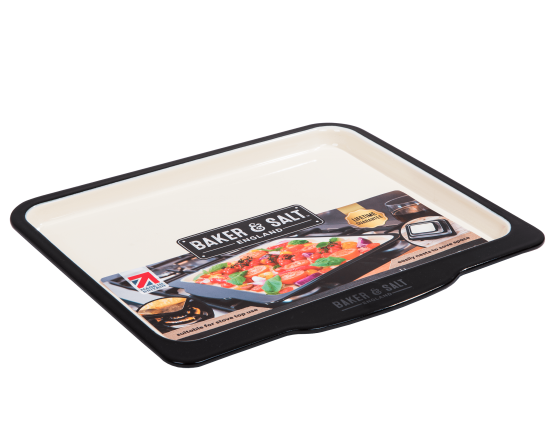 37cm Dish Tray Enamel, heavy weight base steel, creates the sturdy structure of these high quality tins. 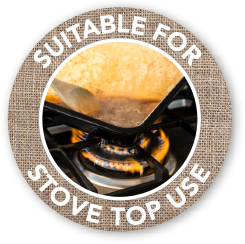 Suitable for oven, stove top, induction, BBQ or any naked flame. They are safe to use with metal utensils. 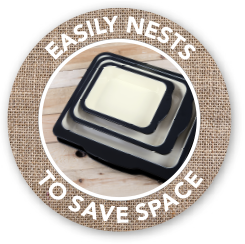 The range nests for compact storage. Using a high quality, heavy weight base steel, creates the sturdy structure of these high quality tins. Once the tins have been formed into the required shape, we work closely with a specialist team of enamelling experts. To create the two tone finish, a highly skilled enameller first applies a base coating to the tin by hand. This is then baked in the enamelling furnace at high temperatures to create a strong adhesion layer. Once the tins have a base layer the enameller then applies 2 more layers to create the finished product, each layer is applied by hand and the put through the enamel furnaces. Cure at 835c the vitreous enamel is hard wearing and durable, in fact it is a layer of glass formed around the metal base. 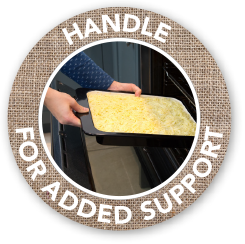 What More UK offers a lifetime guarantee against faulty material and workmanship, when used under normal domestic conditions and in accordance to the care and use instructions provided. In the event of a complaint please contact our customer services department sales@whatmoreuk.com or call us on 01282 687047. This guarantee does not affect your statutory rights.